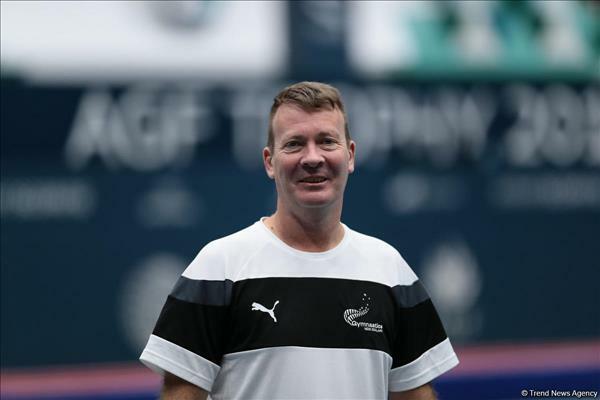 Conditions created in Baku's National Gymnastics Arena are fantastic, Jarrod Heriot, the National trampoline coach for New Zealand, told Trend. Heriot stressed that it is great to stay and train in this arena. 'We are in Baku for the first time and it is a great venue. We have come from far away, so it takes time for us to build up, but when we got in here it was quick and easy, he said. He underlined that the preparations and trainings are going well. 'We are ready, but not completely. I think that till the 16th of February we will be fully ready. Last year the girls did a really good job at World Cups. So we are looking forward to reach the finals, the coach noted. The coach said that he considers Chinese and Russian teams the strongest. Heriot underlined that every competition means a lot because of Olympic qualification. The World Cup in Trampoline and Tumbling will be held February 16-17 in Baku. About 300 gymnasts from 31 countries will take part in the World Cup. Eight FIG World Cups in Trampoline will be held in 2019 and 2020 and two of these World Cups will be held in Baku. Baku hosted the European Championship in Trampoline in 2018. The representatives from 26 countries participated in the championship. The World Cups were organized in 2016 and 2017.